Vassar's student body issued its first publication, the Vassariana, on June 27, 1866, as a bulletin of the year's events. Mary Mallon '15, in her history "The Vassar Miscellany," described the Vassariana as "somewhat after the style of a church fair bulletin in the form of an annual folio." Included in the first issue were the membership list of the single student organization of the time – Philalatheists, a calendar of the year's events, programs of special events (concerts, recitals, Founder's day, etc.) and essays on subjects of interest to a Vassar student. The Vassariana served more as a summary of the year than a literary publication, but the editors recognized the failings of their paper, and aptly apologized, "We are conscious that it is surrounded by many difficulties, that no well trodden path is prepared for its journey, but that we send forth to clear the way for more favored ones which may follow in years to come." The first group of students began to learn at Vassar in the fall of 1865 – that any publication was ready in June of 1866 illustrates the ambitions and achievements of Vassar women. The Transcript of June 1867 showed remarkable progress. Along with a change of name came a wider array of events to cover and a publication twice the size of its predecessor. The second year of Vassar events proved fuller than the first, and an array of student organizations listed their members in the pages of the bulletin. Light-hearted stories, campus news, recipes, poems, and even letters to the editor joined the weighty essays of the first issue, illustrating the growing campus identity. While still a yearly publication, the Transcript showed the beginnings of a legitimate newspaper. For two more years, the Transcript continued to document the evolution of the college at the end of each school year. Mallon recognized the Transcript as " very distinctly understood to be the organ of the Students' Association. The Association appointed the editors, determined the subject matter, changed the title, and passed on the rearrangement of subject matter, but after a time left all of the 'business' of publishing the magazine to the editors." By 1870, the publication was the respected voice of the student body. With its position secured as the campus publication, the Transcript began to push against its restrictions. In 1869, the students petitioned the faculty for permission to publish a bi-monthly version of the Transcript. They were refused. Another petition in 1870, this time for permission to publish a quarterly paper, was also refused. In response, the Students' Association cancelled the paper, and come June 1871, there was no bulletin to document the year. The faculty of 1871, having experienced a year without a college publication, granted the next petition for a quarterly magazine, and after much discussion, the first issue of The Vassar Miscellany appeared in April, 1872. The Vassar Miscellany functioned first and foremost as a literary magazine – its responsibilities as a bulletin were secondary to its responsibilities as a showcase of Vassar's literary abilities. However, in many ways the caliber of the literary sections served as a bulletin on the status of Matthew Vassar's "great experiment." The Vassar Miscellany was not the first student publication in the country, but it likely was the first such publication by women. The paper existed in two capacities, as the initial editorial explained: First, the Vassar Miscellany stood as an outlet for student opinion, for "We have had, heretofore, no means of expressing our opinions, and much that we have often considered unfairness in our instructors has been, probably, ignorance of our real wants," and secondly, the paper was proof of Vassar's right to a place in the realm of higher education. The editors hoped "that our magazine may be a permanent literary influence in the College" and maintained, "… We feel sure we may safely rely on the interest, common to us all, that Vassar should stand where it ought to stand in the field of college literature." The content of the paper served a double function as a communication venue for the community and evidence of the intellectual abilities of women. Ten juniors and seniors edited the Vassar Miscellany under the supervision of faculty members for its first few issues. The editors separated the paper into two literary sections – the first part of the paper held essays, poems, and stories by current students, followed by the Alumnae Department, a parallel venue for Vassar graduates. Initially all contributions by students were anonymous. Many were transcripts of speeches given at Philalethean Society debates or required senior essays. As the paper grew, the selection of essays widened, and authors began to be identified by initials. While the Miscellany since 1892 has been growing to be a more intimate and representative part of the college community in its capacity of a newspaper and as a literary magazine, it has also been reaching out and forming strong connections with those further away. The earlier wails over the lack of interest on the part of the alumnae are heard no more. 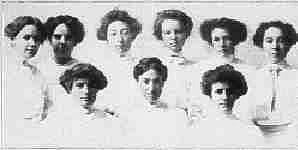 From 1901 to 1906 the Miscellany set aside one issue a year as an "alumnae number." But a more constant connection became desirable – and so in October, 1907 the Alumnae Department as it appears to-day was begun. Like the first quarterly magazine the monthly Miscellany of to-day divides its literary section into a college and an alumnae department. In February 1909 the Associated Alumnae of Vassar College recognized the Miscellany as their official organ. An alumna editor-in-chief with a board of five members now has charge of the Alumnae Department. The relation of the two boards of editors is hard to determine exactly. The board of students represents the Miscellany in all business arrangements with advertisers and printers. In December 1914 the second annual meeting of the two boards was held, at which questions about the size and character of the Alumnae Department were discussed. Both the alumnae and the students feel the increasing difficulty of having two magazines and possibly two policies between a single pair of covers. Perhaps a separate magazine may be established by the alumnae at no distant date. Meanwhile the union of the two magazines has had the beneficial effect of interesting the alumnae in the Miscellany; the Miscellany on its side has gained valuable advice from them. A third branch of the paper, "De Temporibus et Moribus," served as a forum for free expression for all members of the community. The end of the paper, also known as the "back," held all the various college information that defied literary classification. Within this section could be found "Varieties," a collection of quips and poems to amuse readers, "Home Matters, which held news stories about events on college and on other campuses, the "Editor's Table," where criticism of the college could find voice, and "Exchanges," which recognized and occasionally critiqued all the college publications received by the college. While the names of the various "back" sections were constantly in flux, the general content remained the same for the remainder of the 19th century. Until 1892, the "back" was little more than an addendum to a primarily literary publication. Mallon described the Vassar Miscellany until 1892 as " serious, grave, and venturesome in attacking titanic subjects rather than in attempting a variety of subject and form." Essays dealt with weighty issues like poverty and war – the editors were very aware of their position as an example in the world of women's literature, and worked hard to prove their mettle. The editorial staff of 1873 noted, "A new quarterly, no matter how brilliant, if issued by the students of Harvard, or any other university for men, would cause not the slightest ripple on the sea of criticism outside of the little bay of college literature. But the first issue of a new publication from the first college for women must necessarily attract attention. That we have succeeded in winning so much honest and kindly criticism is a good omen. Time was when the very fact of a woman having wrought a work was sufficient to cause it to be ridiculed. But we have realized our highest ambition, - to enter the field of college literature untrammeled by prejudice, to fail if we must, to win if we can." Mallon's research proved the Miscellany did indeed win: "The "high seriousness" of the Miscellany, the sedate tone and dignified appearance awakened the enthusiasm of the exchange editors. The Yale Literary Magazine and the Cornell Era were particularly impressed by the literary merit of our magazine." As the Miscellany gained a respected place in the world of college publications, it began to suffer the trials of any entrenched institution. By the third issue, the editors found themselves lobbying for support within the Vassar community: "The editors make an earnest appeal to the students for help in carrying on the good work which has been committed to their hands. Whether this help be given in lengthening the subscription list or in filling the pages of the magazine, every student is in honor bound to give it; every student must give it if she would see the Miscellany where she wishes it to be. Having put our hand to the plough, let us not turn back. Now, while we are warm with the enthusiasm which belongs to a new enterprise, now, while the encouraging utterances of our friends sound fresh in our ears, let us work with our might to place the Miscellany in the first rank of college magazines." Similar pleas for support continued to surface periodically over the years, and can still be found in the modern Misc. Another means of making connections with people far away has been membership in the Association of Northern College Magazines. After the early attempt in 1882 at a similar organization, the matter appears to have been dropped by the Miscellany until 1899 or 1900. Then the New York State Press Association made spasmodic efforts to bring college magazines together. The Miscellany apparently lost interest in this association almost immediately. In the spring of 1913 the Students' Association empowered the Miscellany to suggest a press association among the northern colleges. The need of such an organization was intensified by the lack of good exchange columns. The Miscellany almost alone among the abler magazine, in its exchange department, offers definite and constructive criticism and not merely complimentary or condemnatory notices. After a great deal of correspondence with many editors the new association met at Columbia in December 1913. A constitution was drawn up, editorial questions were discussed, and officers were elected. The officers of the first year proved to uninterested in the work and the organization almost perished of neglect. Finally a second meeting was held in May 1915. Renewed enthusiasm for the purpose of the association was manifested. The questions of freedom of speech, of subjects for editorials, and of contributions were discussed. Arrangements for an intercollegiate library contest to be held next year were begun. The Miscellany was elected president of the association. The editors' request for student participation succeeded, and the gains in support prompted the establishment of a Miscellany office for the 1876-'77 school year, as well as a new position – business manager. Along with these perks came a change in frequency, though not in format. The paper successfully transitioned to a monthly publication, a change compelled primarily by the financial situation of the paper. Since its beginning, the paper had sold yearly subscriptions to anyone off-campus interested in reading of Vassar's achievements. However, a quarterly paper didn’t "defray current expenses." With a monthly format, less time and money would go into each issue, and the increase in issues would merit an increase in the subscription fee. Also, the ten editors hoped a change of frequency would allow them to redirect some of their efforts towards more campus-related publishing– a monthly Miscellany could devote more time to college news while retaining the literary focus of the quarterly. The change in format soon compelled a change in organization. In 1881, the Students' Association gave up the right to elect Miscellany editors. The outgoing Senior board, in consultation with a committee of three women from the same year as the editor being considered, would elect new editors. The class involved and the Students' Association had to ratify the elections before they were official, but the continuity of the paper was no longer directly in the hands of student government. This new degree of autonomy provided an opportunity to restructure the editorial board. Mallon discovered in her research, "The editors seem to have divided the work of the board much more strictly than is customary among the present  editors. To judge from the printed list of editors, we conclude that one Senior had sole charge of the 'literary Miscellany,' another of De Temporibus et Moribus, and another of Home matters. The two Juniors were given the less prominent departments of College Notes and Exchange Notes." This structure seems to have suited the paper – for the rest of the 1880s, the paper continued with minimal changes, and no lasting evolutions. The ten-year anniversary of the paper brought, in Mallon's words, "a rejuvenation." Up until this point, the primary outlet for student voices was "De Temporibus et Moribus," a section which highlighted narrative accounts more often than opinion pieces. In the 1891-'92 school year, the first "Points of View" section arose as a true forum for public dialogues. A "Book Reviews" section in the "back" of the Miscellany joined the new section, and together they kicked off a new direction for the paper. From 1891 until 1914, the "back" became an ever-more impressive array of comedy, news, and opinion from the campus community. The newspaper aspects of the monthly quickly began to overshadow the literary sections – while literary achievements continued to comprise the front half of the magazine, letters to the editor indicated a growing infatuation with the contributions in the "back." Finally, the editors recognized that the magazine had become a single publication with two vastly different goals. The front and "back" each stood alone. Moreover, the campus as early as 1897 wanted more frequent coverage of campus events. Plans for a separate biweekly issue appeared in a 1910 "Points of View." In the fall of 1913, the editors recognized the need for a weekly bulletin and declared a new publication schedule: a literary Miscellany issue published monthly, supplemented by a campus-oriented Miscellany Weekly. The Students' Association approved the plan on October 13. However, before the editors had a chance to prepare the issue, the faculty advisors cancelled all proceedings, citing insufficient authority on the part of the Students' Association. The faculty was uncomfortable granting the Students' Association the right to regulate non-academic activities. To calm the faculty, the Students' Association created a petition in favor of the change, which they then delivered to the faculty for review. Permission was granted, and the first Miscellany Weekly appeared on February 6, 1914. The new format forced another reorganization of the editorial board. The editorial board until 1910 had required a specific published word count for eligibility, and members had been chosen by the previous editors, approved by their class, and then ratified by the Students' Association. After 1910, the required word count was dropped, but the editors continued to be chosen by the previous board, with minimal input from the English Department. With the Weekly, the editorial board took the opportunity to create a more representative editorial body for the future of the publication. A committee consisting of a member of the English Department, the President of the Students' Association, the Presidents of the Junior and Senior classes, and the current editor-in-chief was created to choose future editors in the hopes of more integrated participation in the Miscellany. Anyone in the Vassar community could nominate an editor, and the committee would review each nominee, choosing future editors from only the recommended students. The Weekly editors took over the "back" of the Miscellany and created an entirely new publication. With the weekly issue covering all campus events, the Miscellany Monthly editors were free to focus on the literary talents of the campus. The Monthly continued as a "testing ground" for Vassar writers. The Alumnae Department, which made up a substantial portion of the literary section before 1914, lasted until 1916, at which point a new publication, the Vassar Quarterly, became the organ of the alumnae. As the Weekly settled into its new position as the bearer of campus news, the Monthly found that the wants and needs of the Weekly publication were at odds with those of the less frequent literary issues. By 1917, the two Miscellany publications shared only business staff – each claimed autonomous editing and received separate submissions. This minimal association lasted five years, but by 1924, it was clear that the monthly and weekly were no longer operating as a joint project. The literary magazine "was failing to achieve its aims," explained the Miscellany Monthly's final editorial. In 1924, the title Miscellany was given exclusively to the weekly publication. The Monthly severed ties with its younger, more successful business partner, and reappeared the next month as Grist, Vassar's autonomous literary magazine. The Miscellany Monthly was no more. Subject File. "The Miscellany News." Vassar College Special Collections (VCSC). "The Miscellany News" by Mary Mallon. Vassar Miscellany [Monthly]. Vol I – X. Poughkeepsie, NY. 1872 – 1924. Vassar College Library.